Replacement: None. We no longer stock these solar panels but there are still some smaller options available in the solar category. This page is for reference only. Have a project that needs some good power? Do you like free power provided by our friend, Mr. Sun? 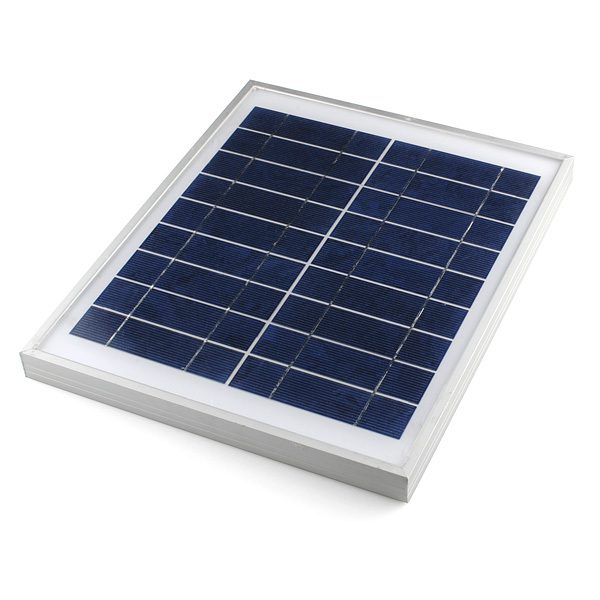 Check out this high quality, high output, fully enclosed solar cell with a nice solid aluminum frame. The panel is more than capable of 10 watts in the open sun. The peak power output is around 8V at 1.25A. The back of the panel has a connection box for connecting ring connector, spade connector, or bare wire. There is even a strain relief clamp inside the connector housing. 14.125 x 11.5 x 1"
How heavy is this panel? It looks like it could fit on my messenger bag! It's the same weight as a pound of pie! Which is 3.14 pounds of course. Pi pounds of pie. A pound of pie weighs a pound. Actually, its kinda interesting that this is almost exactly pi pounds. 1.425 kg is 3.14159 pounds. On your planet it is pi pounds. Here on Jupiter it is a lot heavier. can these be put in series to output at least 12-14 volts? Yes. Two in series will give you 16V / 2.5A max. 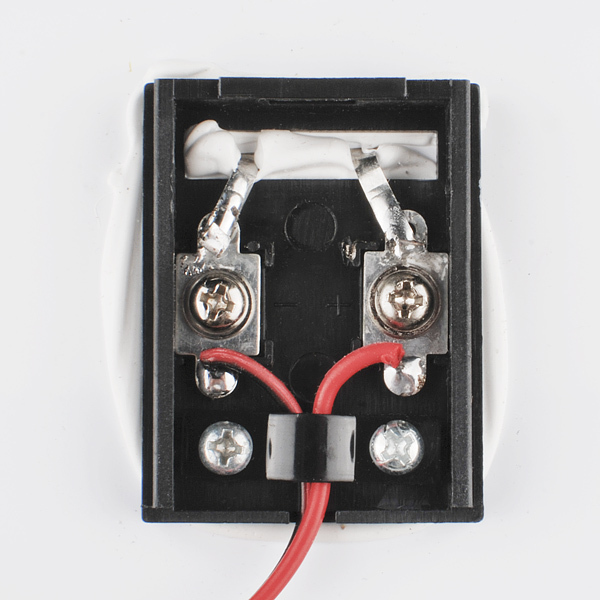 Correction: 16V 1.25A, you don't increase your current capability by adding in series. Oops! You're right, good eye! can it be disassembled to cut down on the thickness? An inch thick seems a bit much. Anyone know when these'll be back in stock? so would this be a good candidate for a solar usb charger? It's fairly large, so it might not be the best if you're looking for portability. Have you measured the open circuit voltage and short circuit current of this unit like what you've done for other solar panels? 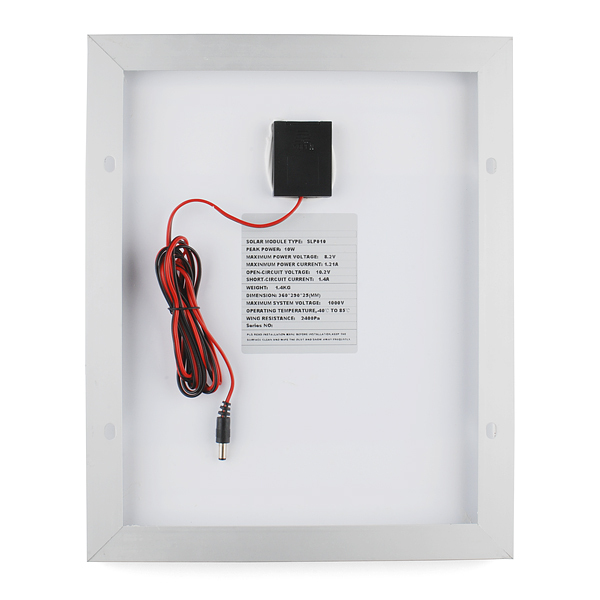 I am in physical possession of one of these panels, and the datasheet at http://sharesend.com/cm096 doesn't seem to be accurate. Both the electrical characteristics and physical appearance are much closer to what's listed here in the product description (although I've seen the completely unloaded open-circuit voltage get as high as 12V). ps: I bought mine from a SFE distributor in Toronto and it came with a ~2m red and black stranded power cord with a barrel plug on the end (that fits nicely into the Arduino, for example). Can anyone confirm that the above spec sheet is correct for this panel? or is the info above the correct details? has anyone found the curves for this panel to understand where the sweet spot is? The specs on the data sheet differ from the product description, and I'm not certain which is correct. Does anybody know what technology are these solar panels?. mono, poly, or (doubtfully) amorphous? Is there a spec sheet on this? We do not. We are going to do more testing once we have a bit more sun. But it's 10 watts and the highest power is achieved at about 8V. It would be nice to know the temperature correction factors as well. 8 volts will run just about anything ive got handy. wonder what the dimensions are? The article says: Dimensions: 14.125 x 11.5 x 1"
I was a little confused at first too though as I didn't see a scale in any of the pictures. Our scales aren't that big. Dimensions are correct. Thanks for mentioning this. We will try to get the scale added to these photos. These panels are huge! It really is about a foot, by a little more than a foot. I can't wait to build something with these.